Botanical medicine involves the use of one or more plant species. These medicines come in several different forms including liquids (ie. tincture, tea), creams or capsules. 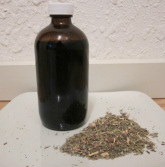 A tincture is the liquid extraction of the plant materials in alcohol making the active ingredients of the plant more available for absorption by the body. Herbs are great for both internal and external conditions ranging from colds and flus to eczema and other skin ailments. Many of today's pharmaceutical drugs are derived from single plant constituents and made to focus on a very specific bodily function which can lead to unwanted actions. Plants have many different uses and when used properly can serve to nourish the entire body or complete a more specific action.